This is the second installment of a regular feature on the Peace Stories blog featuring the stories of our 120 member organisations on five continents around the world. For February 2017, we’re getting to know the Catholic Commission for Justice and Peace, our member organisation in Pakistan. 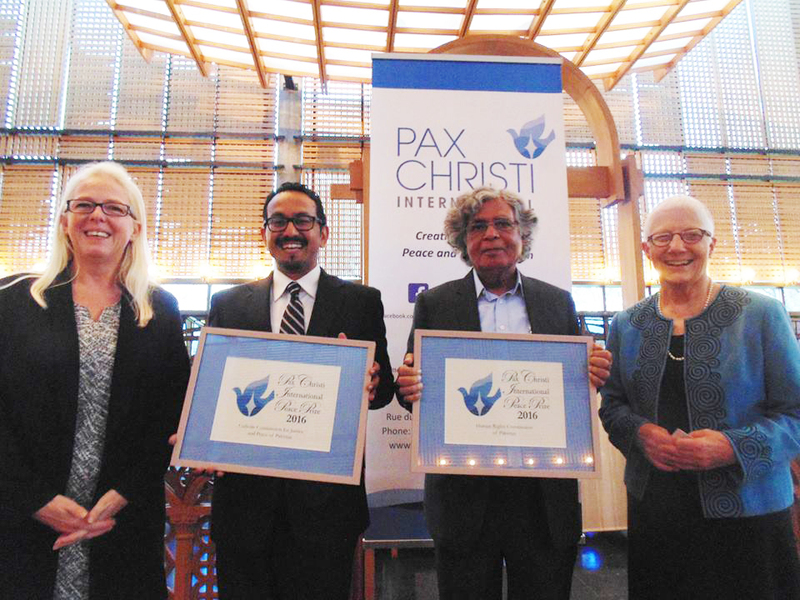 This interview was conducted by Marie Just, Pax Christi International communications intern, with Cecil Chaudhry. Mr. Chaudhry is the Executive Director of the Catholic Commission for Justice and Peace. Marie Just: When and how did CCJP start? Was there some particular event or issue that served to bring CCJP into being? Cecil Chaudhry: CCJP was formed in 1985. This was one year after the then-Government of Pakistan had introduced the blasphemy laws and its severe penalties. In my view, the Commission as envisioned by the founder, the late Dr. John Joseph, Bishop of Faisalabad, was formed as he saw because these laws would give rise to many issues in the future toward the religious minorities. Thus CCJP started on work to address the issues of discrimination which had started in the 1980s. MJ: What is the structure and who are the people involved in CCJP? CC: CCJP is governed by the Pakistan Catholic Bishops’ Conference. It is comprised of the Chairperson, His Excellency, Dr. Joseph Arshad, Bishop of Faisalabad. Under the Chair is an Executive Board followed by the National Director, Fr. Emmanuel Yousaf (Mani), and then the Executive Director (Myself). CCJP has a National Office in Lahore and 7 diocesan offices in each of the Catholic dioceses of Pakistan. Each project or programme initiating from the national office has a programme coordinator who is assisted by a programme organiser. The diocesan offices are headed by a diocesan director (priest/clergy-person) along with one diocesan coordinator and field staff officer at each diocesan office. Furthermore CCJP engages with and relies on information from 300+ activists across Pakistan that get regular training from CCJP on “Human Rights and Reporting”. MJ: What are the current issues you are working on, or what are your major priorities? MJ: How is CCJP putting nonviolence into practice? What role does nonviolence play in your work? CC: CCJP has always practised restraint and promotes a culture of peace which is also advocated in all its activities. Nonviolence plays an extremely important role in our work and approach. We realise that no problem can be solved without peace and a mutual dialogue. That is why CCJP strongly opposes all such forms of violence whether in its work strategy or even through its staff members. MJ: What is the greatest accomplishment of CCJP during your history? CC: During my time here at CCJP, I think the greatest accomplishment was to see how we, through our efforts of advocacy, were able to reverse the decision of the government in posting a job advertisement that clearly discriminated towards the religious minority. While there have been many more important instances, however, the promptness of the response from the government in this regard was encouraging to see how our work is valued by the government too. MJ: Is there any story about CCJP that stands out for you? CC: There are many stories to share. However for me seeing the gradual change in the curriculum in order to promote a unbiased education system holds a special place in my heart. Probably because I also have studied such biased material in my school days thus now that I am a father this issue and the success however small it may be is very important and dear to me. It was a joy to see that after 20+ years the government has finally brought back chapters on the role of religious minorities into the School textbooks, something that’d been removed in the 1980s and 90s.